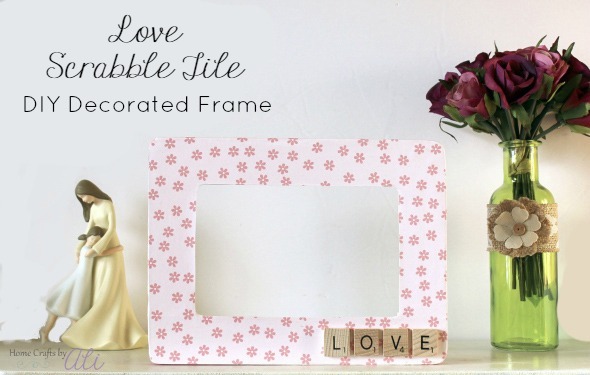 Display a picture of you and your sweetheart in this easy to make decorated frame. When you follow this simple tutorial, you can have a cute frame perfect for displaying a lovely photo in less than an hour. This week I was looking in the garage for some items I bought a while ago at the thrift store. 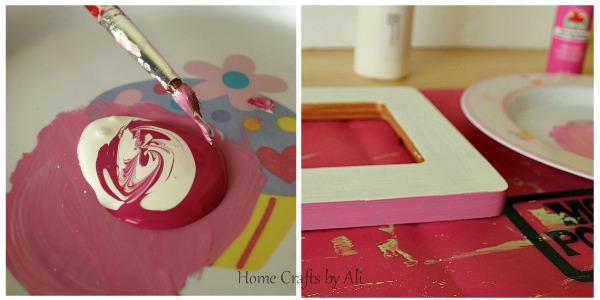 I found a plain craft wood picture frame and thought that it would be fun to decorate it. 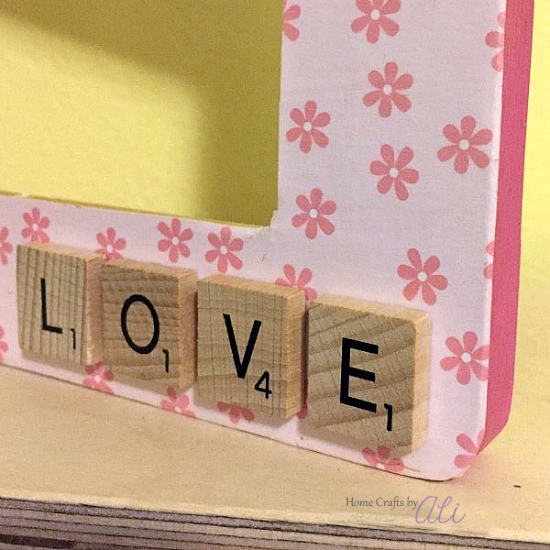 This frame could be used for Valentine's Day, an anniversary gift, or to display a picture of you and your sweetheart. This is a quick project to work on, it took me a total of 45 minutes, and that included letting paint and glue dry. 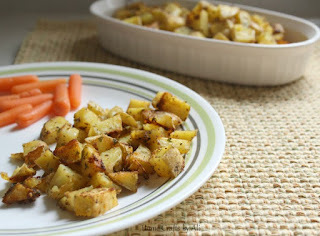 You could make this while your little ones are down for a nap! A few notes about my supplies. I tried three different glues (E6000, all purpose craft glue, and hot glue), and the E6000 worked the best in keeping the tiles in place. It is industrial strength so please remember not to use it in a closed space. 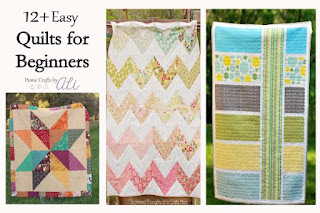 You do not have to own a craft mat to complete this project. You can use newspaper you have lying around. I use my mat because it works so well to cover my crafting space, it is re-usable, my wet projects don't stick to it, and it is easy to clean. You can read a full review HERE. 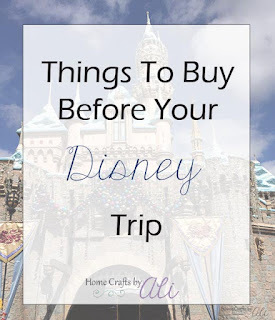 If you happen to be at a thrift store, check out their crafting/wood projects/holiday area. I find these wood frames there every time I go and I spend .50 on them (50% savings). The paintbrush you use with the Mod Podge will probably not be usable again for painting. I sometimes use a foam brush instead of a bristle paintbrush when working with Mod Podge. 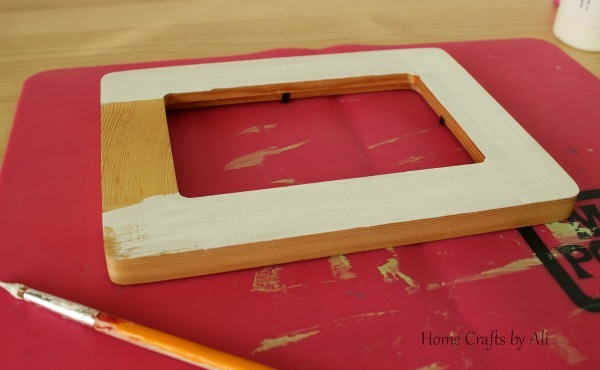 Start by painting 1 coat of paint on the front of the frame that will be covered with paper. I use white because I have a large bottle of it. You do this so there is texture for the mod podge to adhere to better. Next I mixed my bright magenta with some white and painted the sides of the frame. Oh, don't mind my "palate" I use to mix colors. I just grab an old plate that my girls used to use when they were little. The acrylic paint is easy to clean off and we use them for art projects all the time. For the side of the frame I generally paint one coat, let it dry (5 minutes or so) then paint another coat so the color is rich and even. The sides will be seen as your frame is displayed, so you want a nice and even coating. 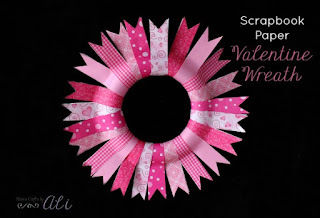 Trace the frame on the back side of your scrapbook paper, then cut out the piece you will use for this project. I usually save the piece that you cut out from the middle where the opening is. It's quite a large piece and you never know when scraps are going to come in handy. 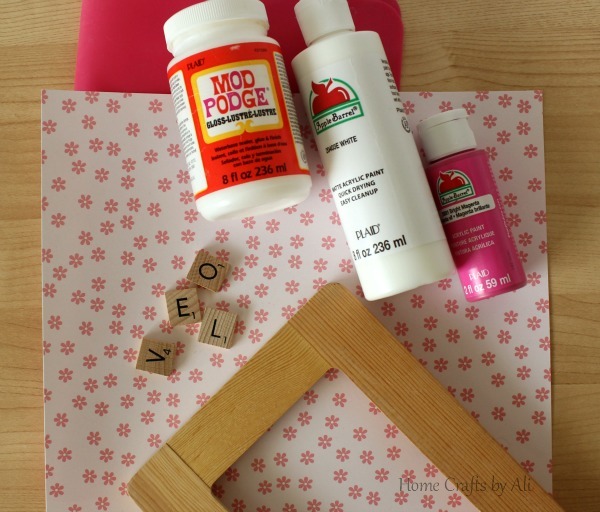 Next you will work with the Mod Podge all purpose glue. I spread a thin but even layer on the wood frame and also on the back of the scrapbook paper. This helps it adhere strongly and evenly. Smooth the paper gently with your fingers to make sure there are no air bubbles. NOTE* If you only put Mod Podge on the frame and place the paper on top, there will be parts that don't stick and it can ruin your project (I speak from experience). Also, don't put too much of the glue on the paper and wood because if it is too thick then when you go to smooth it, it can tear the paper (also from experience). At this point, let the Mod Podge completely dry - about 10-12 minutes. After it is dry, use a brush to paint a thin layer to the front and sides of your project - over the top of the paper and the painted sides. This will act as a sealer for your project. I use the gloss because I like the slight shine. If you don't want your frame to shine, you can use their Matte formula. There may be a slight bit of overhang of the paper on the edges. That is an easy fix. Use the side of a paintbrush to gently smooth that little bit to the side of the frame. 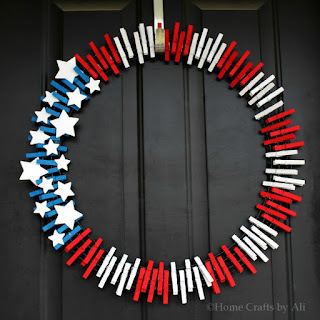 Use a small dab of the Mod Podge to help it stick smoothly to the side. 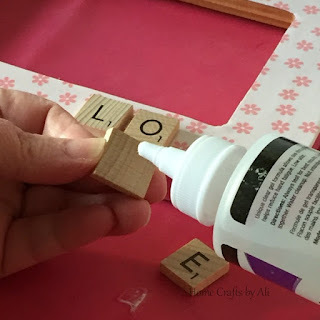 Let the sealant layer of mod podge dry for about 5 minutes or so, then you can glue the Scrabble Tile letters to the frame using your E6000 glue. It is a strong glue, but it doesn't dry immediately like super glue. If you need to, you can move your letters around a bit to make sure they are even. And that's it! Your love frame is finished. As soon as the letters dry you can add a picture and put the backing on. If you have a flat shelf, you can just set your frame there. If you want to hang your frame, you will have to add hardware (found at any large home improvement store) to the back of the frame. That only takes a minute or so. I hope you enjoyed this tutorial and found it useful. I would love to see any frames you makeover - you can share them on my Facebook page. This is really cute! We have a bunch of scrabble tiles leftover from a making Christmas ornaments for family members a couple of years ago. I will need to see if we have these letters. I love finding frames to repurpose at thrift shops. I have a large stash of different shapes and sizes of frames. They always have one and I just can't seem to pass them up. Thank you for visiting Julia. Sometimes the fun part about crafting is the process....trying, failing, trying again.